We are the sole agents for Celericom realtime performance and maintenance monitoring systems. A technical feasibility study found that Christchurch Men's Prison could greatly reduce its annual water heating bill with gas assisted solar water heating for its laundry. An EECA grant reduced the payback to less than eight years, and drastically reduced the Prison's carbon footprint. SolarPeak designed the system for seamless integration using 21 SolarPeak AP30 evacuated tube collectors covering 97m². 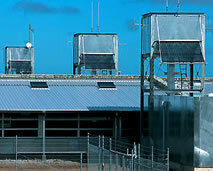 The prison now has one of the largest solar water heating systems in the country. The system was designed to deliver 7000 litres of water per day at a temperature of 80 degrees Celsius. The design was developed by Glenn Harvey, Accredited Solar Designer, who also project managed the installation. This included the manufacture of two 3,125 litre storage cylinders, gas integration, and commissioning. The system is monitored via a datalogger which records all system functions. During the first day of operation, the system heated 3,125 litres of water from 19 – 70 + degrees Celsius using only solar energy. This is an excellent result for an August day in Christchurch, and outperforms the worst case forecast for this system by a healthy margin. The new Selwyn District Council building was official opened by the Governor-General, The Honourable Anand Satyanand on 29 September 2007. Designed by award-winning architect Ian Athfield, the complex has four linked blocks and Council chamber, and features environmental sustainability, energy efficiency and state-of-the-art information technology. The building has been oriented to take full advantage of the sun to warm its interior, as well as installing the latest SolarPeak solar water heating technology. Rainwater is collected for use in some toilets and stormwater is directed into rain gardens.